Hello everyone: Autumn has always been my most favorite time of the year, love the amazing display of colors and beautiful temperatures, not to hot, not to cold, just right. 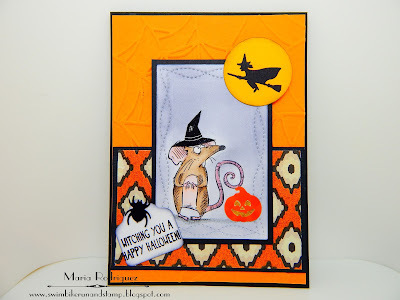 Also, the Holidays are near and homes around here are starting to decorate for Halloween, which I enjoy doing a lot so, here's a card I made to add to my stash of "spooky" cards for family and friends, I will link this card to a few challenges at the end of this post. I had this awesome stamp set from Kaztelkraft called Les Rats de Ville and, I think you'll agree, they are both adorable and kind of.....how should I put it?.....creepy?? I don't know but, what ever feeling they inspire, I just love them. I stamped this one onto a panel of Strathmore water color paper with Stazon black ink and colored it with Prismacolor pencils, the moon is just punched out and so is the Witch (this is an old Martha Stewart punch), I embossed the background with an embossing folder, the pattern paper is from my stash. The spider on the sentiment and the little pumpkin are from a bag of confetti that is going to last me for a life time. 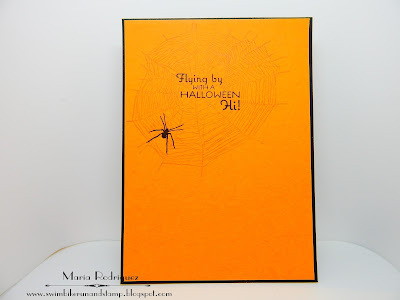 The spider web and spider are from a retired SU set called "Bite Me" and the sentiment from a retired Flourishes set called "Witching You a Happy Halloween". Sheepski Design Challenge #6 "Feature a Creature"
Pearly Sparkles Challenge #20 "Fur and Paws"
One Crazy Stamper Inc. September Challenge "Seasons of Celebration"
2 Crafty Critter Crazies Challenge #6 "Must have a Creature"
Hello everyone: If you think about it and, even if it's only September, Christmas is truly just around the corner so, I made this little card to add to my stash so, when the Holidays are here, all I need to do is write a sweet message, address, stamp and seal the envelopes and send this Merry Messages on their way to family and friends. Christmas Challenges are great to increase your stash so, I hope you participate often. Here is my card and I will enter it onto a few challenges at the end of this post. I stamped this old Flourishes image onto a die cut panel of water color paper and colored it with SU markers and my Wink of Stella, which I filled with water after the glittery stuff had run out so I can still use it, it works perfectly. 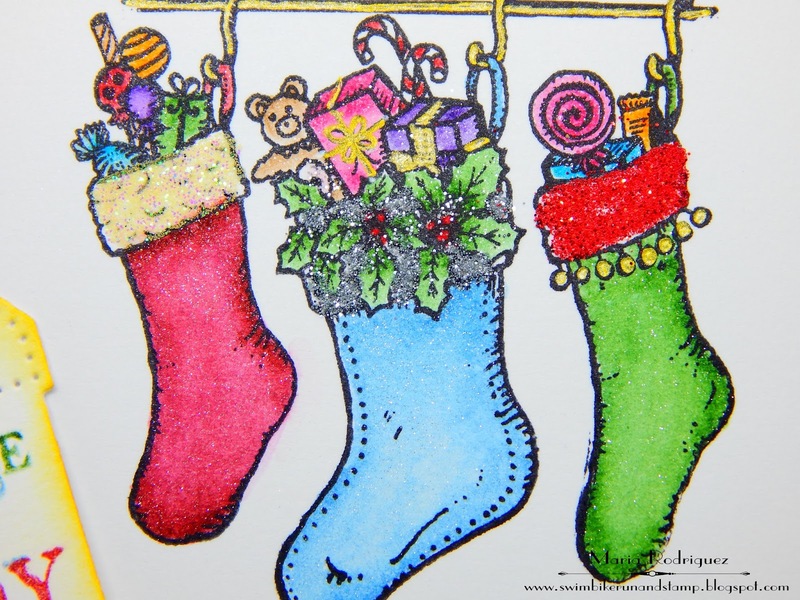 I added some glitter to the top of the stockings, hope you can see it better on this picture. 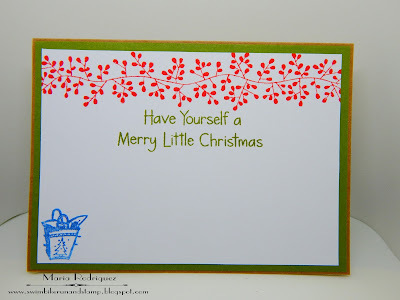 The garland was stamped with the retired SU set called "Bordering Blooms", the sentiment is from my stash and the little gift from another retired Flourishes set. 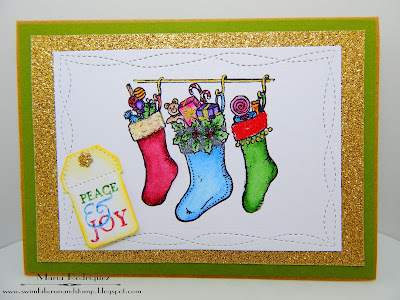 ABC Christmas Challenge S is for Sketch, T is for Trio, I chose the Trio of Stockings. 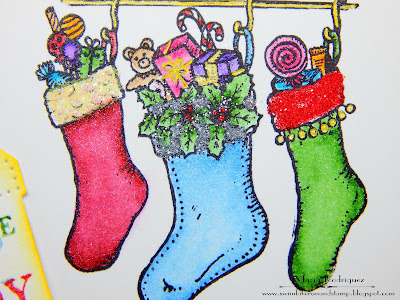 The Merry Christmas Challenge Challenge #33, "Anything Goes + Christmas"
Double D challenge "GLITTER, GLITTER, GLITTER"
Thank you for stopping by, I always read every single comment you so kindly leave on my posts, I want you to know I appreciate them more than words can espress. 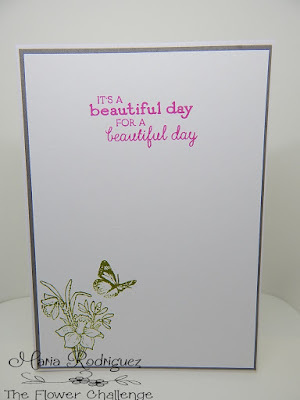 Hello there dear blogging friends: It feels so good to be able to be in my craft room having fun with my stamp sets, inks, markers, papers, giving my MOJO a chance to wake up from a very long slumber. So here I am with a fun card that will be entered into a few challenges at the end of this post, hope you like it. 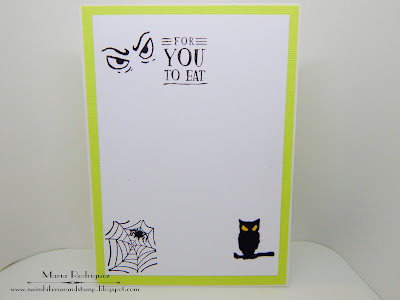 This "yummy" image is from a retired Stampin' Up! set called "Jar of Haunts", this is one of those sets that could never, ever go out of style, I love each of the spooky and fun images and sentiments. 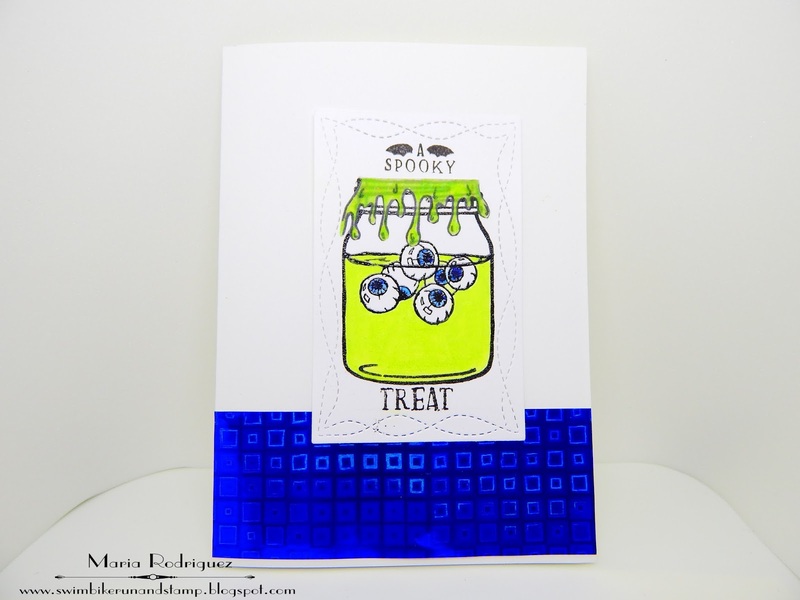 I stamped this jar and the eyes with Versafine black ink and heat embossed it with clear embossing powder then, I colored the iris of the eyes with blue and the slime with lime green. I stamped the dripping slime onto a scrap of vellum with Stazon black ink and colored it with a green water color pencil. The blue holographic paper is from an old gift bag, I knew I would use it one day!! The sentiment and spooky eyes are from the same set, the spider web from my stash and the owl was punched with an old Martha Stewart punch. 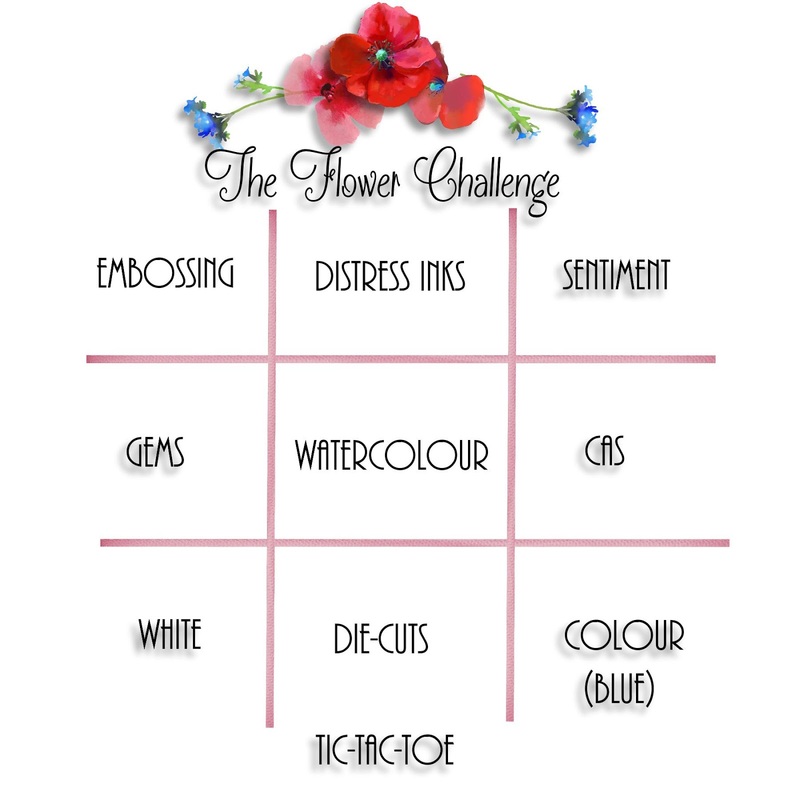 I will enter this card onto the following challenges. Everybody Art Challenge #408 Clean and Simple. Cardz 4 Guyz Challenge #177 "Something beginning with the letter "D" (DISGUSTING)? 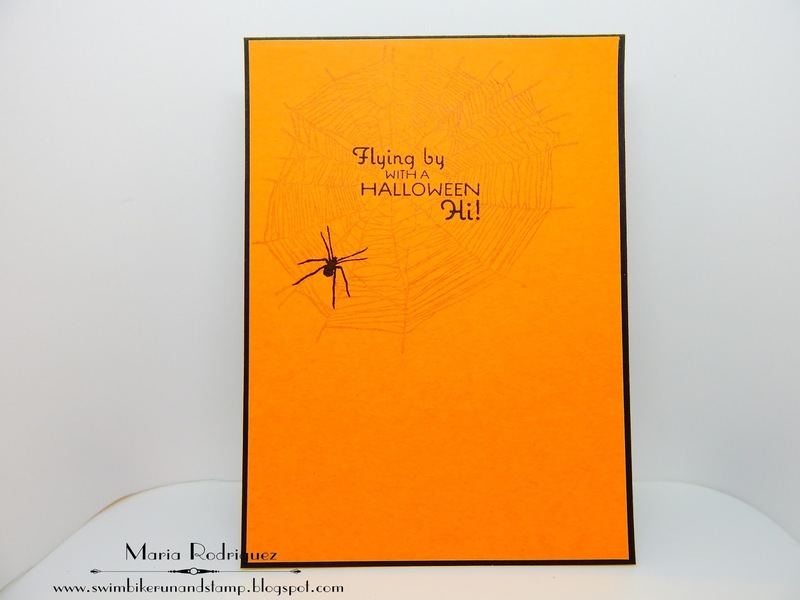 Tuesday Throwdown #359 "Punches and or dies" I used both. Hello everyone: The new challenge over at SHOPPING OUR STASH it's all about what's trendy out there in the crafting world. I must confess I had NO idea what's trendy now a days so I had to Google this question and also, I ask my dear teammates for their suggestions. There are a lot of things that I didn't know are trendy, like Cactus and Succulents, copper, mason jars, Mermaids, Macrame, burlap, Nuvo Drops, woo hoo!!!!! 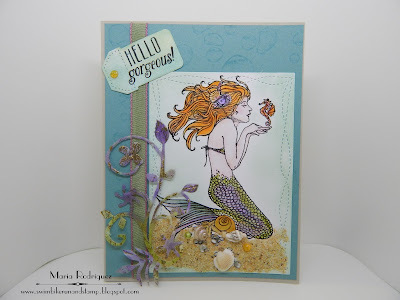 So, because I love all kinds of Fantastic creatures I went with Mermaids, plus I was totally able to SHOP MY STASH and found some beautiful shells and sand from our Spring Brake vacations with our grandkids and also, some already made Nuvo Drops and a left over die cut I made with the Tissue Paper technique, so here is my card, hope you like it and get inspired to join us in our gallery. This gorgeous Mermaid is from Stampendous and it's been just waiting to get inked up for months. I stamped her onto a piece of water color paper and colored it with water colors and Prismacolor pencils. 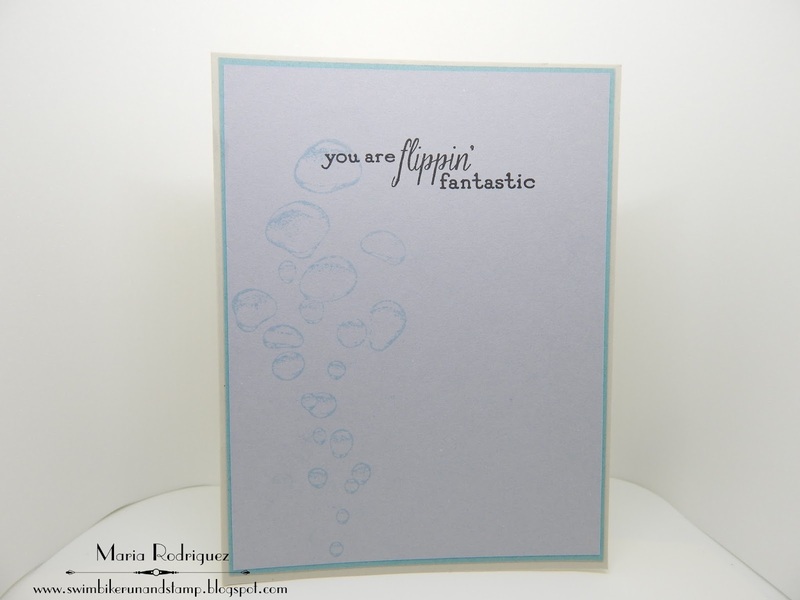 The sentiment is from a Power Poppy set called Best Day Ever, the bubbles are from a set from Designs by Ryn. The sentiment and bubbles are from the same Power Poppy and Designs by Ryn sets. 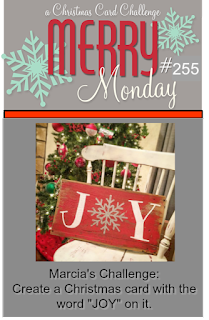 I hope you come and play along with us over at SHOPPING OUR STASH so you can see the awesome projects my teammates have there to inspire you. Do not forget to stop by their blogs for details and to leave some blogging love. Hello everyone: I've been absent for quite a while due to the fact that I had to take my 94 y/o Mother back to Mexico, she had been living with us here in the USA for 5 1/2 years, I've taken care of her for all of this years but now, her health is declining and she needs a specialized kind of care that I just can't give her here. So I traveled with her, which in itself, was truly difficult but now, she is in a nice place, near my brothers and, most of all, in a warmer climate, Winters up here in NW. Indiana can be brutally cold and long. 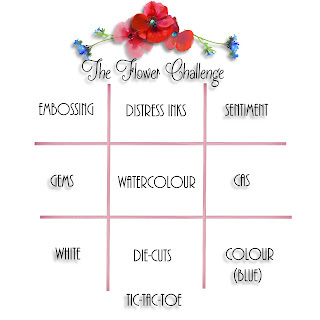 But anyway, I'm slowly getting back into the crafting swing of things so, here is my card for THE FLOWER CHALLENGE #12, which is a Tic, Tac, Toe challenge, full of awesome possibilities. Here is the template and, below it, my card. I hope it inspires you to play along with my teammates and I in our gallery. 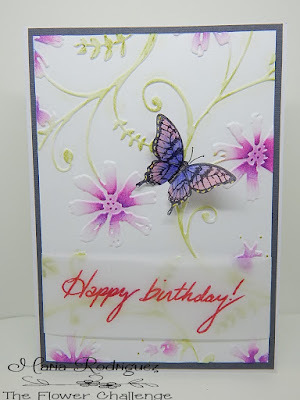 For my card I chose the first horizontal line, which is "Embossing, Distress Inks and Sentiment"
I dry emboss my panel with a Cuttle Bug embossing folder and, carefully sponged some Tim Holtz Distress inks in Picked Raspberries, Peel Paint and Tumbled Glass. The sentiment is heat embossed onto Vellum, the butterfly is from a retired (or retiring) set called "Papillion Potpourri" I stamped it with Stazon black ink on a scrap piece of Vellum and colored with Prismacolor pencils on the back. 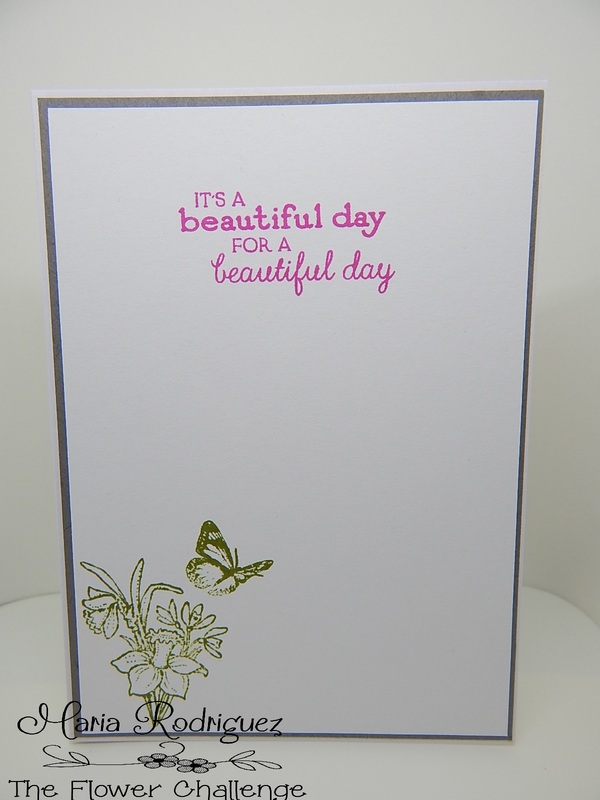 The sentiment is from a Power Poppy set called "Best Day Ever", the flowers and butterfly from an old Flourishes set. 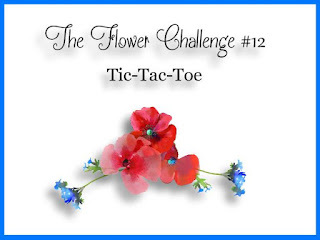 I hope you stop by THE FLOWER CHALLENGE and give this fun Tic, Tac, Toe challenge a try, do not forget to stop by my teammates' blogs to see their awesome creations and leave some comment love. 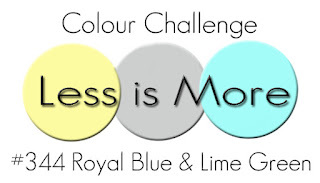 This challenge runs until September 25th. 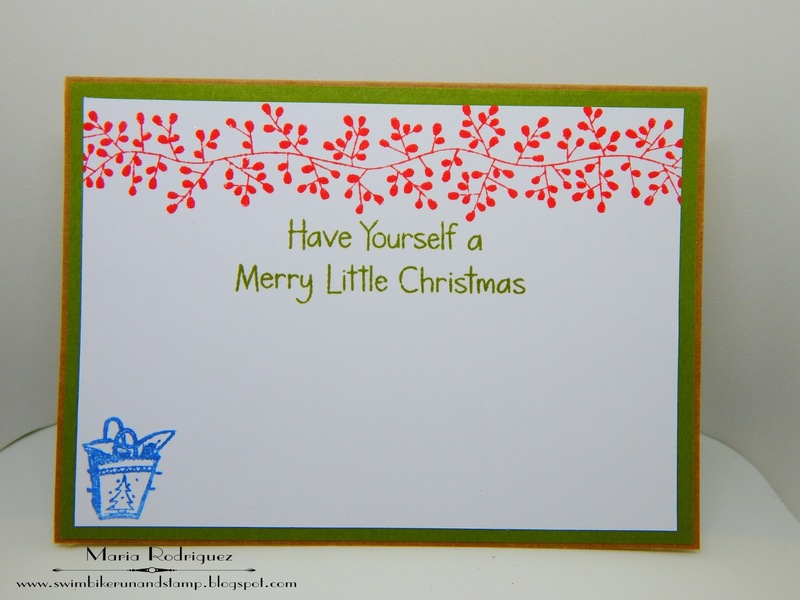 so you have plenty of time to get creative and share your beautiful cards in our gallery. Please read our rules, they are few but important and also, please add our challenge banner to your post when you upload your card to the gallery.